The 2017 Bristol Short Story Prize is open for entries. The competition is open to all writers, whether published or unpublished, UK or non-UK based. 20 stories will be shortlisted and published in Bristol Short Story Prize Anthology Volume 10. The winner and 2 runners up will be selected from the shortlist and announced at an awards ceremony which will be held in Bristol Central Library on October 14th 2017. 1st prize is £1,000, 2nd prize is £700, 3rd prize is £400. 17 further prizes of £100 will be presented to the remaining shortlisted writers. The closing date for entries is midnight (BST) May 3rd 2017. The maximum word limit is 4,000, there is no minimum. Stories may be on any theme or subject and entry can be made online or by post. There is an £8.00 entry fee for all stories submitted and entries must be previously unpublished. All styles, genres, and notions of what constitutes a short story are most welcome. Please show us what is possible in a short story! The fantastic judging panel will be chaired by writer, Tania Hershman. Tania will be joined on the panel by the writer, Roshi Fernando, Simon Key, owner of the award-winning Big Green Bookshop, and Juliet Pickering, literary agent at Blake Friedmann. For full details and rules on the 2017 Bristol Short Story Prize please click here. 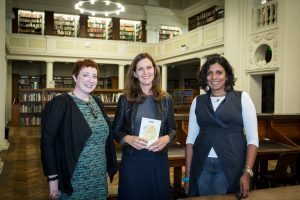 The 2016 Bristol Short Story Prize was won by Stefanie Seddon for her story, Kãkahu. Tanner McSwain from Chicago won 2nd prize for his story, The Red Sea, and 3rd prize went to Berlin-based Kate Brown. The Bristol Short Story Prize Anthology Volume 9, featuring the 3 winning stories plus the 17 other shortlisted stories is available to order here.